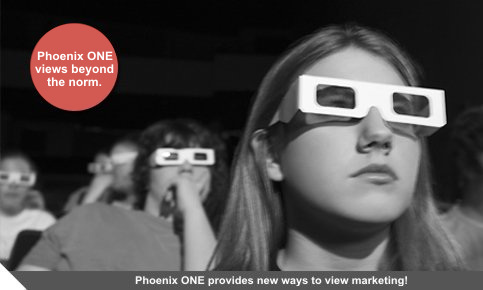 Phoenix ONE provides small and large companies complete marketing solutions. To view our services please visit our website and learn why we have become a leading marketing consulting firm and advertising agency for both B2B and B2C businesses. Phoenix ONE can assist you in both sales management and marketing implementation to plan, develop, build, and grow YOUR business. Our array of clients range from small business to multi-national firms. "A mythical bird that never dies, the phoenix flies far ahead to the front, always scanning the landscape and distant space. It represents our capacity for vision, for collecting sensory information about our environment and the events unfolding within it. The phoenix, with its great beauty, creates intense excitement and deathless inspiration." It is said the phoenix rises from the ashes and emits greater strength and true grace." We treat every client and their engagement like they are our one and only client. All information contained within or on this site/blog is copyright protected. If you would like to request permission to use or reprint any of the content on our site, either on line or in a print format, please contact us . If we grant reprint permission, all articles must be reproduced in their entirety, unedited, and accompanied by the following copyright/reprint statement: "Copyright © 2011 Your Business Wisdom.com All rights reserved. Reprinted with permission from Phoenix ONE LLC.